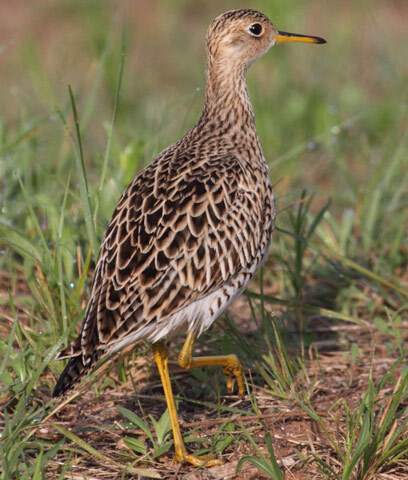 Upland Sandpiper: Breeds from central Maine west through Canada to southern Alaska; southeast to northern Utah, northwestern Oklahoma, and northern Texas, and east to central Tennessee, Virginia, and Maryland. Spends winters in South America from southern Brazil to south-central Argentina. Preferred habitats include large fallow fields, pastures, and grassy areas. The Upland Sandpiper is the "shorebird of the prairie". While most of its relatives are never found far from water, this species has made itself at home on the grasslands. Older names are the Upland Plover and Bartram's Sandpiper. The genus name and the old common name Bartram's Sandpiper commemorate the American naturalist William Bartram. Once abundant in the Great Plains, it has undergone steady population declines since the mid-19th century, because of hunting and loss of habitat. The Upland Sandpiper has a large range, estimated globally at 3,300,000 square kilometers. Native to the Americas and nearby island nations and vagrant to Antarctica, Australia, Europe, and Asia, this bird prefers subtropical, temperate, or tropical grassland ecosystems as well as pastureland. The global population of this bird is estimated at 350,000 individuals and does not show signs of decline that would necessitate inclusion on the IUCN Red List. For this reason, the current evaluation status of the Upland Sandpiper is Least Concern.